This past week, there has been great discussion amongst my friends about what I refer to as the “ugly brown couch.” Really, it is ugly. I’m not sure that it has ever really “seen better days,” but Racer says that it has. This is my understanding of the story of our couch. The couch was pulled off the curb during Racers fraternity days in the late 90’s. It spent a couple of years in a fraternity house (up on cinder blocks to allow for “stadium seating,” then spent a couple of years in a college living rental with more boys. When he moved out of that house, into his own bachelor rental, it was in his living room. When we got married, I “banned” the ugly brown couch to the garage for 4 years. Unfortunately, we had a dog tear up the cushion on our couch and we needed something different. Because we couldn’t afford something and “we have it just sitting in the garage,” the ugly brown couch was moved into our living room. Some friends took pity on us as they got something different for their playroom and gave us their old set (we became at least the 3rd owners of that set). I TRIED at that time to get Racer to put the ugly brown couch to rest, but he refused. So, I refused to help move it and he did, by himself, back out to the garage. There it sat – covered in “stuff” so high you couldn’t even sit on it – until it came time to move. I tried again to get Racer to leave the couch off the truck and put it to rest. Nope. The ugly brown couch now sits in our play/family room. Racer figures that the kids and dogs don’t need anything nicer to tear up, jump on, spill on, etc. 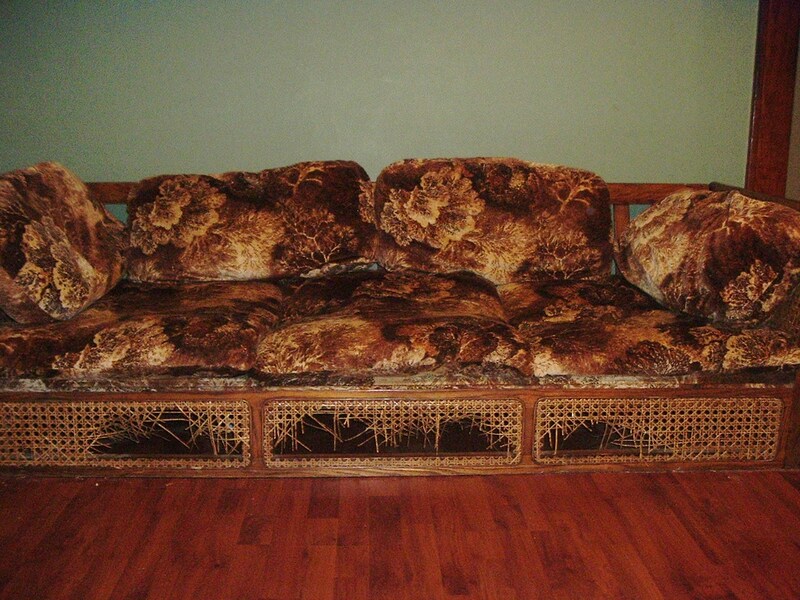 So what does this ugly brown couch look like? It sits about 13″ off the floor. My 9 month pregnant self has to roll off of it. At this moment, Racer is “watching” the Texas Cup Race with his eyes closed, enjoying how comfortable the ugly brown couch is. This couch has caused much disagreement in our marriage. I’ve cried over it, yelled over it, screamed over it, cursed over it and been otherwise ugly over the “ugly brown couch.” That’s partly why I call it that. It brings out ugly things in my character that I don’t like. It’s a couch. I guess it’s just not for me to understand. What I do understand, is that the ugly brown couch isn’t worth it. It’s not worth my anger, my character, my relationship with Racer, my energy. Fighting against it is NOT worth it. Am I right about the couch – does Racer need to let go and let it go? I guess you can decide that and talk to him about it. But me being right is not worth it. So, until the day comes when we get something “new to us” for the play/family room, the ugly brown couch stays. And when it moves out of the house, I’m sure it will go back into the garage. But when the day comes, you better bet I’ll help load and unload it to its final farewell!